As we drove out along the Cooley peninsula towards Carlingford we decided to visit Kilwirra Church in Templetown. As the name suggests this area is associated with the Knights Templar, a Western Christian military order associated with the Crusades. We came across the very impressive gateway pictured above, so naturally we decided to visit. 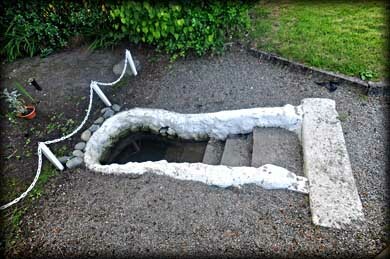 The sides of the well are walled in and steps down to it were put in place in 1934. The statue of Our Lady was erected in c.1947. The site is well maintained and now sheltered by a tall semi-circular hedge. 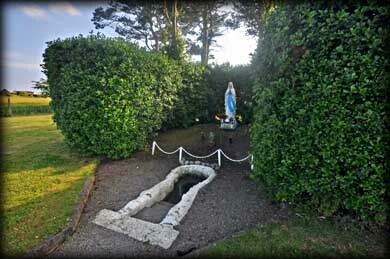 A Rosary is recited at the well on the 15th August. Traditionally it is believed the water can provide a cure for sore hands or sore eyes. Situated: Heading east on the R175 take the right turn sign-posted Templetown. After 1.6 K turn right signed Templetown. The well is 1.5 k down here on your right. Discovery Map 36: J 2113 0582. Last visit July 2013.